Apologies to anyone who gets this in their mailbox twice — I’m not sure what happened the first time. According to various unreliable sources on the Internet, tomorrow is National Clean Out Your Refrigerator Day. Although this holiday has some major flaws — I don’t get the day off from work, and I’m pretty sure I’m supposed to spend it cleaning out my refrigerator — it’s still my favorite. Why? Because its very existence implies that most people clean their refrigerators just once a year. I clean mine at least twice that often, which means my fridge is twice as clean as the national average, which makes me feel smug and superior, which is my favorite way to feel, which makes this my favorite holiday. Also, I don’t have to cook anything, buy presents, or give out candy. I don’t even have to clean out my refrigerator, really, because if anyone looks, I can just say I’m keeping stuff in there for National Science Experiment Week — which technically doesn’t exist, but who’s going to check? 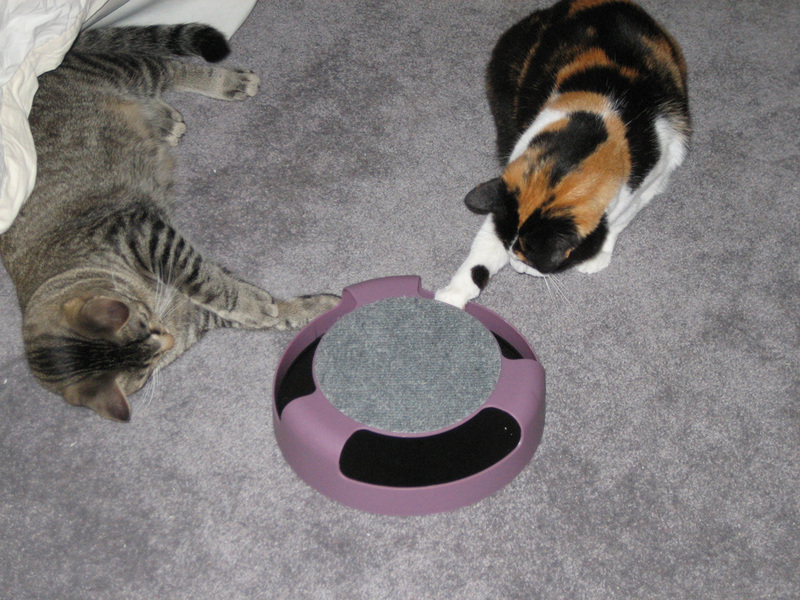 Thunder and Holly operate the particle accelerator. Actually, why isn’t there a National Science Experiment Week? Doesn’t that sound like it would be at least seven times as much fun as National Clean Out Your Refrigerator Day? I’d probably celebrate by running a small-scale version of that experiment where neutrinos probably didn’t travel faster than light, using the particle accelerator in my basement. Just kidding! I don’t have a basement. But I do have a particle accelerator, which I got for $19.95 at the pet store (it was marketed as a cat toy, possibly because the particles that it accelerates are arranged in the form of a toy mouse). And my phone has a stopwatch app, so I’m all set — or I would be, if National Science Experiment Week really existed. But it doesn’t, so I guess I’ll just clean out my refrigerator instead. A note to anyone reading this outside the US: apparently there is no International Clean Out Your Refrigerator Day. I’m sorry you have to miss out on all the fun. Or as we call it in my house “What in the name of God is that SMELL coming from the refrigerator?! Someone please throw that out!” day. I’ll be celebrating. I am already. I wonder whether there’s a National Try to Get Someone Else to Clean the Refrigerator Day. Now there is a holiday I would truly enjoy. It’s less creepy than National Clean Out Someone Else’s Refrigerator Day. Dammit woman!! Why didn’t you tell me this earlier?? I literally, not even an hour ago, cleaned out the fridge AND cleaned the Tupperware. Now I can’t celebrate!! OF MY OWN VOLITION. I think maybe instead I am reading your thoughts. This means my psychic skills are improving. At this rate, I will win the National Science Week Fair of Northwestern Houston. YAY!! The truly awful thing is, I learned about this holiday Sunday night. So I had plenty of time to warn you. Maybe you can get away with a ceremonial swipe with a towel, or something. I wonder whether there’s a National Pair Up Your Tupperware Containers with Their Lids Day. I’d actually probably need a week for that. You Americans have all the best holidays! I think I might just celebrate this holiday anyway, though, but I think I’ll cal it Eat Everything in the Refrigerator Day since I’m pretty hungry. Fun fact: Eat Everythng in the Refrigerator Day comes right before Become Violently Ill with Food Poisoning Day. In my house we celbrate this holiday irregularly, under the name “Husband-Should-Do-Something-Nice-To-Show-It’s-Not-The-Wife’s-Job Day”. Though we rarely say that. Or get cards for it. Does blowing the refrigerator up count as a science project? It only counts if you have a second “control” refrigerator that you don’t blow up. Okay, that definitely qualifies. But if you’re blowing things up, I’d suggest a scatter chart. I only observe the drinking holidays. Looks like I’ll be “cleaning out” that entire box of rosé tomorrow. I couldn’t find any good drinking holidays, but as I was looking, I discovered that October is both Vegetarian Month and Seafood Month, which seems like a conflict of interest. St. Patrick’s Day, New Year’s Eve, Toothache Day… really, Laura, it’s like you’re not even trying. I’m sorry. I was unable to focus on my holiday research because I was still reeling from discovering the October Paradox. Is it at least seven times as much fun as National Clean Out Your Refrigerator Day (or as you imagine National Clean Out Your Refrigerator Day to be, if you’ve never been here to experience it)? I’ll be asking for the day off. First I’ll need a trip to Home Depot for a chisel and crowbar. There might also be power tools involved. Yipppeeee! Do they sell hazmat suits at Home Depot? No, but they do sell large sheets of plastic drop cloths. Oughta work! Apparently, I celebrated this holiday early. A couple weeks ago when I couldn’t find room for my new groceries in the fridge, I asked if I could throw out their milk from May. MAY! Did you try to pour it down the drain, only to discover it was no longer a liquid? I was afraid to do that. I took it right out to the dumpster. Cats are really good at performing experiments but terrible at writing up the results. Do you know for a fact there’s no science experiment day? Because there IS a national leave a zucchini on your neighbor’s porch day. And a national windowed envelope day. Science experiments seem much better than windowed envelopes. You know how sometimes you a day where you read something, and you’re 99% sure that the person who wrote it is just kidding, and then you google “zucchini porch day”, and you find out she was serious? I’ve been having one of those days. I’ve got big plans for Take It In The Ear Day. Wow. I think I might have a new favorite holiday. I would never advocate a holiday that forced people to clean something of theirs. On the other hand, I’d love a holiday where everyone had to clean something of mine, like National Wash Laura’s Car Day or National Scrub Laura’s Floor Day. I’ll bring the RF cavity resonators!!! I had to look that up. You have no idea how relieved I was to find that it wasn’t a device used in some new unpleasant security procedure at the airport. I’ve been trying to start a National Science Experiment Week but nobody takes me seriously because I know almost nothing about science. I’ve never been so glad to be an American. I just found this comment languishing in my spam queue — sorry about that. I hope you and your refrigerator had a happy holiday.